Faithful children of God may look forward to sharing Jesus’ glory in the presence of the Father. “To live is Christ; to die is gain.” Why, then, does the Lord God not take people Home to Himself as soon as they, say, become empty nesters – or the spouse dies? Why does He let the older become old? The question is important, if only because there are numerous older men in the churches who feel they have no task to do, are out to pasture. In his letter to Titus, the apostle Paul speaks first of the continuing task of “older men” (2:2), then of “older women” (2:3). In this article we consider Paul’s instruction concerning the “older men” as he words it to Titus: “Teach the older men to be temperate, worthy of respect, self-controlled, and sound in faith, in love and in endurance.” To give you the punch line right away, God keeps older men on earth because He uses them to build up His church. The Lord saw that it was not good for the man to be alone, and so made a “helper” (Genesis 2:18) to be with him. In the relation between the man and the woman in Paradise, he was the leader and she was not; she was the helper and he was not. So when God came to the Adam and Eve after their fall into sin, he sought out the man: “where are you?” (Genesis 3:9). When the Lord sought to call a family from Ur to go the land of promise, He did not call Sarah to take her husband and leave her mother’s household, but He summoned Abram to take his wife and leave his father’s household (Genesis 12:1). The point is that the man is, by God’s ordinance, the leader in family and society. As leader, the man invariably gives leadership, whether active or passive, where positive or negative. When Paul, then, tells Titus what to teach the older men, he’s instructing him in relation to that part of the human race commissioned to take responsibility and give leadership. The men Titus must teach are ‘older’. The term ‘older’ is, of course, relative, and really depends on how old Titus is and perhaps depends too on the average age of the congregation where Titus ministered. Paul uses the same word to describe himself when he was some 60 years old (Philemon 9). Irrespective, though, of what age one wishes to peg to the term ‘older’, the term certainly describes a person who has been around the block a few times. The ‘older’ have, in other words, spent years in the school of life and so are in a position to show others how to do life. Our Canadian culture says that “older men” deserve the opportunity to kick back, enjoy life and play with the toys they’ve accumulated. Beneath that polite exterior is the thought that the older men are actually out of touch, can’t keep up with the fast pace of the younger, and so are really beyond their use-by date; they should be retired from any role of leadership or influence in society . There is an echo of this thought in the church, to the effect that the older men (are made to) feel passed by and even uncertain about their purpose. The result is that they retreat into their seniors’ circle…, and become an untapped resource. The fall into sin obviously complicated the task enormously. But it didn’t change the expectations God had for Adam as he grew older, or for the subsequent generations of older men. So God told Moses that He poured the plagues on Egypt “that you may tell your children and grandchildren how I dealt harshly with the Egyptians…, that you may know that I am the Lord” (Exodus 10:2). Moses, we need to know, was more than 80 years old (see Exodus 7:7) at the time God gave him this instruction. Talk about the role of “the older men”! Fully in line with this command is the prayer of the psalmist: “Even when I’m old and gray, do not forsake me, O God, till I declare your power to the next generation, your might to all who are to come” (Psalm 71:18). Because of this God-assigned role of the aged, the Lord commanded the youth of Israel to respect the seniors (and not just the grandparents); as an older man approached them, the youth were to “rise” and “show respect for the elderly” (Leviticus 19:32). Here was recognition that the older have learned so much in God’s school-of-life and were a reservoir of experience and wisdom for the younger to tap into. Sadly, not all older men speak only wisdom. Job’s three senior friends spoke the language of fools in their reprimands to Job (cf Job 42:7; 32:6ff). Solomon advised older folk not to say, “Why were the old days better than these?” (Ecclesiastes 7:10). Young People live in the God-given present (and not in the past), and in the challenges God gives today they need encouragement – and not the signal that today is too hard. Older men, in other words, need to make it their business to be careful how they analyze the present in relation to the past; their analysis requires ongoing Bible study and thought…. The term “temperate” translates a word that appears elsewhere as “sober” or “sober-minded.” The term is often used in relation to drink and so becomes instruction in being moderate in how much you drink. Yet Paul’s point is not that older men are simply to exercise moderation-in-drinking. Rather, in all of life one is to be moderate, not indulgent, not extravagant, not into excess or glut. Herein the “older men” of the church would contrast with the typical attitude of the Cretans around them; they were “always … lazy gluttons” (1:12). What, though, is wrong with excess? Why must Titus make a point of tell older men to be moderate? Older men (should) have learned the truth of Solomon’s words in Ecclesiastes 2, when he tried all sorts of excess in his attempt to make sense of life. As so many young men do in an effort to try to figure out life, Solomon too sought fulfillment in wine, houses, gardens, women, song, parties, and more. But the more he tried, the more he realized that things do not lift us out of the thorns and thistles of a life outside Paradise. His conclusion was this: “when I surveyed all that my hands had done and what I had toiled to achieve, everything was meaningless, a chasing after the wind” (Ecclesiastes 2:11). That was the advantage of older age: Solomon could tell the younger of his realm that he’d been there, done that… – and they should take instruction from him and not repeat his futile search. This is the message Titus was to instruct older men to convey to the younger. Those older men had been around the block, had tested the value of more and more stuff, and so were in a position to vouch for the truth of Ecclesiastes 2. These “older men” have “fought the good fight”, “have finished the race” (2 Tim 4:7), and now await the summons of the Lord to enter the presence of their Father-in-Jesus Christ. So their lifestyle was to model that life is not about food, property, looks, degrees, music, chocolate, gin, and women. Instead, their lifestyle should reflect that delightful fact that “the grace of God that brings salvation has appeared” (Titus 2:11); Christ has come to redeem sinners, take away the cause of our eternal hunger and misery, and through His self-emptying on the cross restored sinners to Paradise. Since that’s so, one needs to be consistent and say “No” to ungodliness and worldly passions (2:12), “no” to more toys, more drink, more ‘buzz’, etc, and live instead “godly and upright lives in the present age, while we wait for the … glorious appearing of our great God and Savior, Jesus Christ” (2:13). Hence a ‘temperate’ lifestyle is in place, moderate in one’s demand for food and drink, for wealth and holiday. That’s the “older men”; they’ve learned through the school of life to get their priorities right, so that their emphasis lies on service to the neighbor, a service that reflects God’s love for us in Jesus Christ…. Titus is also to instruct “older men” to carry themselves in a dignified manner. Again, the point is not so hard to grasp. Older men have buried parents, and perhaps also a spouse or a child. They have been through war, sickness, fire, flood, drought and more – and so learned through the hard knocks of life that life is not a joke. They’ve learned that trials come from God as so many divine teaching moments whereby the heavenly Father would train us in the school of life for further service and to be more fruitful for His glory. Older men (ought to) know this, and so take God’s reality seriously in the hard knocks of life; always the question presses on their minds: what is God teaching me through this…. No, this does not make the older boring or gloomy (as if life is not enjoyable). On the contrary, living every step of life in the awareness that you live every moment in God’s school makes life exciting, and fun. Older men model this awareness – for benefit of the rest of congregation. That’s the sort of leadership they are to give…. “Cretans are always liars, evil brutes, lazy gluttons” (Titus 1:12). In the eye of one’s mind one can see the “lazy gluttons” of the island, with their shrunken biceps and ample waistline assembled in the coffee shops and beer parlors, and the conversation about the latest horse race, hockey game, cruise, property deal, woman…. How thoroughly North American…; truly, there is nothing new under the sun…. The new Christians of Crete were raised in that culture, and remained greatly influenced by what was accepted around them. How tempting, then, to adopt the same attitude; “eat, drink, and be merry….” Hence Paul’s instruction to Titus: since older men are by God’s ordinance to be leaders, instruct them to be temperate…, to be examples for the women and younger men to follow. This, Paul figures, is necessary to build up congregational life (1:5a). The Lord has prepared a glorious future for His (older) children, yet leaves older brothers on this earth for a purpose; they remain here to be examples for rest of congregation. So, older men: take up the task, with confidence! You’ve been through the school of life, and so know that not things, pleasure gives fulfillment, salvation, or purpose; by faith you know that Jesus Christ has restored us to God. That being so, model the gospel for the benefit of the rest of the congregation: be moderate, dignified, self-controlled in a manner that the younger of the flock can see. This is the service to which you remain called, until such time as God Himself relieves you and gives you the crown of glory. There is definitely so very much in the congregation for which we may be thankful. That includes the large number of older brothers in our midst. They are here, by God’s providence, for a reason. My conviction is that they are under-utilized. No, I’m not thinking now of consistory work; it may indeed be so that the Lord does not call the (much) older brothers to that task anymore. I’m thinking instead of how the older, without exception, have a role to play in relation to the younger. 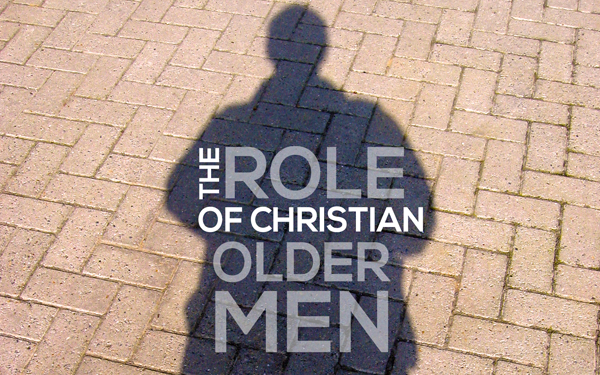 Let the older men take their mentorship role seriously, being deeply aware that God leaves them in this life in order that they might model the gospel for the benefit of the younger and even seek out the younger to speak to them of the works of the Lord as they experienced them over the years. It’s a privileged fact: the younger need your leadership, example, and instruction. Recall Ps 92: “the righteous … will still bear fruit in old age …, proclaiming, ‘The Lord is upright; He is my Rock, and there is no wickedness in Him’” (vs 14f).